♦ The late Nusrat Fateh Ali Khan is one of the key artists on Real World Records and certainly one of the most influential. His voice is universally recognised as one of the great voices in musical history and he was key in bringing the Qawwali music tradition to the Western world. ♦ Qawwali is a form of Sufi devotional music popular in South Asia, particularly in areas with a historically strong Muslim presence, such as southern Pakistan, and parts of North India. 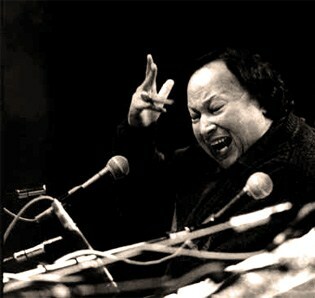 ♦ Nusrat Fateh Ali Khan’s legacy has enraptured millions across the globe with his magnificent and haunting voice. In his lifetime he collaborated with many Western musicians including Peter Gabriel, Eddie Vedder and Michael Brook. His vocals appeared on soundtracks to films directed by Martin Scorsese, Oliver Stone and Tim Robbins. It was the late American singer–songwriter Jeff Buckley who, in 1993, described Nusrat Fateh Ali Khan as “my Elvis”. ♦ This biography was provided by the artist or their representative. ♠ Canadian experimental guitarist Brook and the late, “shining star of Qawwal” come together for a second time to bring the music of Pakistan into a creative new realm. If you are a traditionalist who wants nothing but Pakistani music, stay away. This album is soaked in ambient electronic guitar noises and some of Khan’s most out–of–the–tradition singing. These experiments are not to be confused with lots of the electro–noodling, however. Both artists were devoted to their gods and their music, and it shows in the potency of these tracks. Brook seems to have been a natural match for Nusrat and has drawn out an unusual performance that probably fulfills the ideas that were only hinted at in their first collaboration, Musst Musst. — Louis Gibson /// Michael Brook (born 1951 in Toronto, Ontario, Canada) is a Canadian guitarist, inventor, producer, and film music composer. He plays in many genres, including rock, electronica, world music, minimalism and film scores. He was nominated for a Grammy Award in 1996 for his production work and as a co–artist on Pakistani singer Nusrat Fateh Ali Khan's album Night Song. ♠ Hybrid (1985 EG) — solo material with Brian Eno and Daniel Lanois collaboration. ♠ Sleeps with the Fishes (1987 4AD) — collaboration with Pieter Nooten from Clan of Xymox. ♠ Mustt Mustt (1990 RealWorld) — collaboration with Nusrat Fateh Ali Khan, record is credited only to Ali Khan. ♠ Cobalt Blue (1992 4AD) — solo record, mostly electric guitar. ♠ Live at the Aquarium (1993 4AD) – recording of a live concert, sometimes packaged together with Cobalt Blue. ♠ Shona (1995 Sine) — an unofficial release, recorded live during the Lanzarote Music Festival, December 1989. ♠ Dream (1995 RealWorld) — collaboration with U. Srinivas and Trey Gunn. ♠ Night Song (1996 RealWorld) — second collaboration with Nusrat Fateh Ali Khan. ♠ Star Rise (1997 RealWorld) — last collaboration with Khan, remix album of tracks from Mustt Mustt and Night Song. ♠ Black Rock (1998 RealWorld) — collaboration with Djivan Gasparyan. ♠ Assembly (2002 RealWorld) — collaboration with Hukwe Zawose. ♠ RockPaperScissors (2006 Canadian Rational) — most recent solo record. ♠ BellCurve (2007) — a remix of the album RockPaperScissors by James Hood. ♠ Penumbra (2008 Canadian Rational/bigHelium) — collaboration with Djivan Gasparyan.